Ok I'm not sure I can really express how much I love ground turkey. I have officially crossed over from beef and I'm never going back! Well except when it comes to hamburgers and meatballs... Anyway, I love the taste, texture, price and the leanness of ground turkey. This is the package I always get and the quality is great. 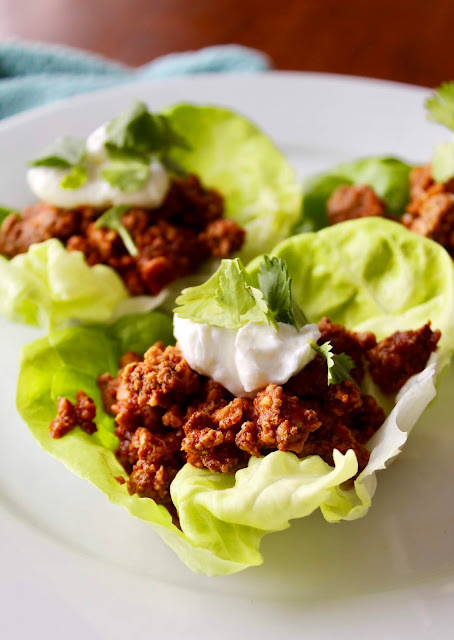 The turkey combined with my amazing taco seasoning recipe makes these irresistible. And I don't think there is anything more refreshing than eating a lettuce wrap. So crunchy and fresh! And be sure to top these with all of your favorites. 1. Hand mix the spices in with the ground turkey and cook, breaking it up with a wooden spoon until no longer pink, about five minutes. 3. Spoon turkey into individual lettuce leaves and top with desired toppings.